If you've ever broken out in hives, you know how frustrating and painful this condition can be. They may itch, sting, or burn and can appear unexpectedly on any part of the body. While hives tell us that the body is reacting to some substance it's sensitive to, it can often be hard to tell what that substance is. A variety of foods, additives, and medications as well as sunlight and even strong emotions can all trigger a hives outbreak. Because of this, people are able to pinpoint the source of their hives in only about 25-30% of cases. Hives can occasionally involve symptoms of shock or difficulty breathing. In these cases, they need to be treated as a medical emergency. But most of the time, hives are just plain annoying. They can last from minutes to weeks and are most frequently treated with antihistamines or corticosteroids to relieve the symptoms. However, none of these treatments truly address underlying causes of hives, particularly if the trigger is unknown. Oriental medicine practices can help address imbalances in the body that manifest themselves in the skin. Practitioners of Oriental medicine may recommend a combination of acupuncture, dietary changes, and lifestyle adjustments. What they use depends on whether the hives are red, indicating that wind and heat are involved, or pale pink or white, indicating that wind and cold are involved. 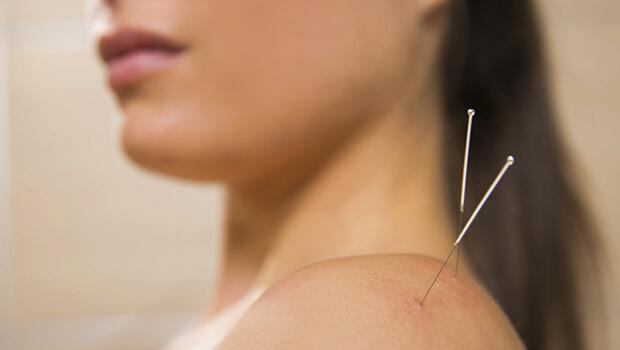 Some people may be skeptical that acupuncture can really affect hives. But according to a study published in the Internet Journal of Dermatology, it can make a big difference for people who suffer from chronic hives. However, if you have chronic hives, a condition also called urticarial, don't expect it to go away after one treatment. According to this study, you have to stick with the treatment long enough for it to work effectively.